JAVOedge Clear Case and Sync Cable Reviewed | BlackBerry Blast! Have you heard of JAVOedge International? They make all kinds of mobile gear including cases, cords, styluses, and screen protectors. I had a chance to look at their clear cases and USB Sync cable this week. The sync cable is available for nearly all mobile gear so check out the JAVO web site at the link below. 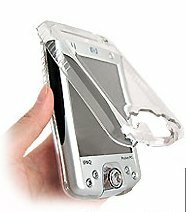 I used the clear case for the iPAQ 2215. When I saw the picture on their web site it looked very interesting and I was anxious to try it out. The case fits perfectly around my PDA, and even "clips in" on the back of the unit for stability. On the front of the case there cut out holes for the power button as well as the navigation buttons on the bottom of the unit. On the back the holes are for the speaker, reset button, sync cable, and even the CF card slot. 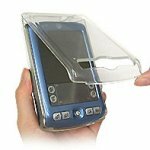 Once I got my PDA in the case and got the case shut I wanted to use the PDA. You can press the buttons and bring up your calendar or contacts list but you cannot use the stylus on the screen. Okay, maybe that's obvious but it was very deceiving because the case is clear, and therefore it looks like you should be able to use it when it's closed. Maybe they will make a version of this case that would have a cut out for the screen. This way, it would protect the edges of the PDA while still allowing you to work with the stylus. I found that opening the case is not very easy because the case fits so tightly on the PDA. You can see in the picture below just how perfectly fitted the case is. Sometimes you forget it's actually on there. When I opened the case my PDA actually started to slide out so I had to figure out a way to open it without that happening. I looked on the JAVOedge web site and they had some instructions there. For me, it seems the best way to open the case is to actually have my thumb on the PDA (through the cut out for the sync cable) to hold it in place while I lift the top cover off the PDA. Perhaps the next version of this case will address this small problem. Once the case is open it flips up and back so you can easily work with your device. When I went for my Stylus I realized that the stylus was within, or under the case. How was I going to get it out of there? I looked and finally realized that JAVOedge had provided a little lever, embedded in the case, that picks the stylus out for you. Very nice. The cut out for the CF card is nice, but it does not allow you to remove the protective cover for your CF slot with the case closed. You have to open the case to remove the protective cover. Once I removed the cover and put my Wi-Fi card in, I was able to leave it in there and use my PDA. One feature of the case that I will use often is the ability to stand the device up on end. Because of the way the case is made I can actually stand my iPAQ on its head so to speak. Althougth this is not really a feature of the case, it does help in one way. 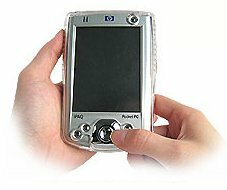 When I travel, I used my iPAQ to play music. Sometimes I use headphones but other times I just play it out of the speaker on the back. 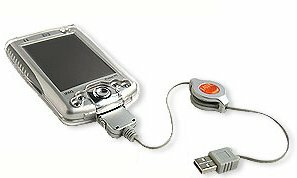 By standing my iPAQ on end, I can face the speaker in any direction I want, and it actually sounds better if you can believe that. The case is very reasonably priced at $23.95 so it won't break the bank. I also got a chance to check out the JAVOedge USB sync/charging cable. There is not much to say about this device other than the fact that it is totally cool! It's a retractable cable that enables you to sync your PDA and charge it at the same time through a USB connection on your PC or laptop. This is a dream scenario for me because I've been traveling with an extra charger. Bye, bye charger! It works like a dream. I plugged it in and my iPAQ started syncing automatically, and the charging light started going. Great job! I would highly recommend this cable for anyone who travels frequently. It comes in 2 colors (black and silver), and is very compact and light. The best part is the price of $14.95. Check out the JAVOedge web site for more details. They make this cable for almost every PDA out there, and Smartphones too. You can even get an attachment that allows you to turn the cable into a car charger. Now how cool is that?